DCNR Secretary Cindy Adams Dunn joined Bureau of Forestry and ClearWater Conservancy officials in applauding acquisition of a 570-acre tract that expands Bald Eagle State Forest to more than 197,000 acres. “This invaluable addition to the state forest system comes at a time when more and more people are being drawn to these woodlands by a variety of interests and activities,” Dunn said, speaking on the Centre County site popularly known as the Decker Tract. 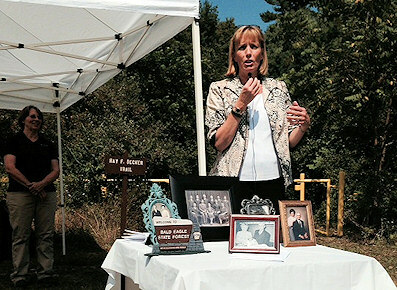 DCNR Secretary Cindy Adams Dunn addresses those gathered to help celebrate teh acquisition of a parcel of land to Bald Eagle State Forest. Located just outside the borough of Centre Hall, the new state forestland is key to watershed protection and increased recreational access, and benefits all Bald Eagle State Forest visitors, the secretary said. DCNR’s Bureau of Forestry worked with ClearWater Conservancy to place a sales option on the property and then transfer the option to DCNR when acquisition funding was available. Finalized May 14, the $1.71 million sale, including a variety of buildings, was financed through the bureau’s Oil and Gas Fund. “This is a great acquisition for the ClearWater Conservancy, the Bureau of Forestry and the Decker family,” Dunn said. ”It is only fitting that future plans for this tract call for an extension of the Ray Decker Trail with the state forest’s Greens Valley Tract and the James Cleveland Memorial Trail. Now part of Bald Eagle’s Green Valley block, the Decker property at 2823 Lower Brush Valley Road is accessible from Route 192, just east of Centre Hall. Details on Bald Eagle and Pennsylvania’s other 19 state forest districts can be found here. Would you like to send this email to a friend?